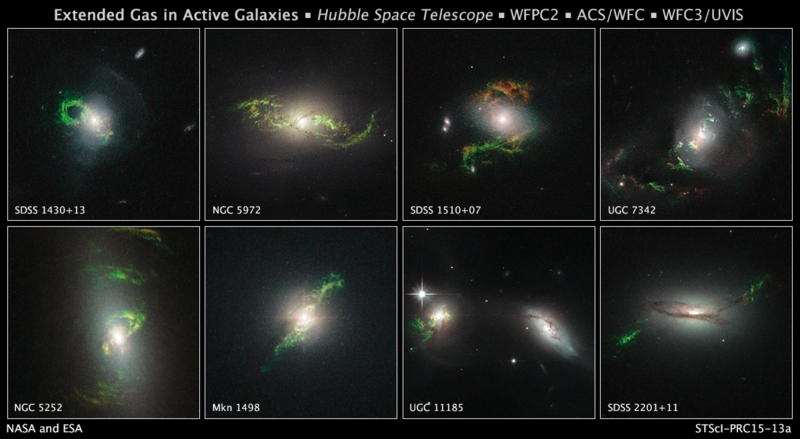 The wispy green clouds seen in these galaxies are unusual because they are so bright. They are emission nebula stimulated into glowing due to a burst of ultraviolet light. That by itself isn’t unusual, but the central quasars aren’t particularly bright. The brightness of these surrounding clouds indicates that the quasars were quite bright in the past. Given the scale of these clouds and their current brightness, the light stimulating the emission originated from the quasar tens of thousands of years ago. That might seem like a long time for a quasar to go quiet, but on a cosmic scale that’s pretty fast, and quasars don’t typically vary much in brightness. So what’s going on? One idea is that the quasars are powered not by one supermassive black hole, but two. Two closely orbiting black holes could disrupt the flow of matter into each other, and this would cause the brightness of the quasar to vary. This would seem to be supported by the shape of the clouds themselves, which tend to have a twisted, spiral shape indicative of merged galaxies. Two closely orbiting supermassive black holes should produce tangible gravitational waves.